KANSAS CITY, Mo. 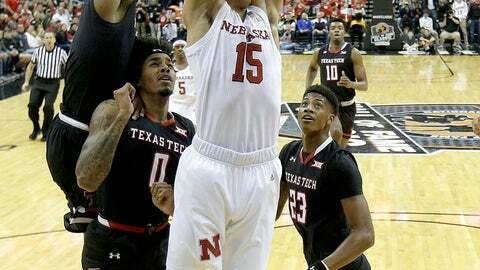 (AP) — Texas Tech made every possession a grind, fought for every loose ball, dominated in the paint and imposed its will on Nebraska in a throwback to the old days of the rough-and-tumble Big 12. All that fight produced a title in the Hall of Fame Classic. Jarrett Culver finished with 26 points, Matt Mooney scored 15 and the Red Raiders overcame a slow start by ramping up the defensive intensity Tuesday night, pulling away from the Huskers in the second half in a 70-52 victory in the first meeting of the former league rivals since the 2011 season. The Red Raiders (5-0) trailed 15-6 in the opening minutes before going on a 12-0 run to wipe out their biggest deficit. The game remained close until midway through the second half, when Culver and Mooney began to get loose on offense and slowly padded Texas Tech’s cushion. The crushing blow came with 8 minutes left, when Culver hit 3-pointer from the corner. Miles was given a technical foul at the other end when he thought a traveling call should’ve been made, and Davide Moretti made both free throws to extend the Red Raiders’ lead to 57-42. They leaned on their stingy defense the rest of the way. They also left an impression on one of their biggest fans. After playing a high-profile Monday night game in Los Angeles, Chiefs quarterback Patrick Mahomes was courtside for the championship game at the Sprint Center. The Texas Tech alum stood and cheered on just about every made basket, and seemed to lament every miss as much as anyone else. Isaac Copeland Jr. scored 20 points and James Palmer Jr. had 13 for the Huskers (4-1), who were trying to win their first in-season tournament title since the 2000 San Juan Shootout. Copeland joined Culver and Mooney on the all-tournament team along with Southern California’s Bennie Boatwright and Missouri State’s Keandre Cook, who squared off in the third-place game. Culver was voted the tournament’s most outstanding player. Boatwright scored 22 points, Jonah Mathews added 21 and USC connected on 17 3-pointers — its most in 17 years — to romp past Missouri State in the tournament’s third-place game. Kevin Porter Jr. added 14 points, Derryck Thornton had 12 and Nick Rakocevic scored 10 for the Trojans (3-2), who bounced back easily from a turnover-laden semifinal loss to the Red Raiders. USC used first-half runs of 13-0 and 16-0 to take control, pushed the lead to 44-27 by halftime and coasted down the stretch with the only question whether the Trojans would top 100 points. Ryan Kreklow hit six 3-pointers and had 23 points to lead the Bears (3-2). Cook added 21 points and Kansas City native Jarred Dixon hit five 3s and finished with 17. Texas Tech heads back to Lubbock to face Northern Colorado on Saturday, while Nebraska welcomes a visit from Western Illinois on Saturday. USC returns to the Galen Center to play Cal State Bakersfield on Sunday and Missouri State heads to Murray State on Saturday night.